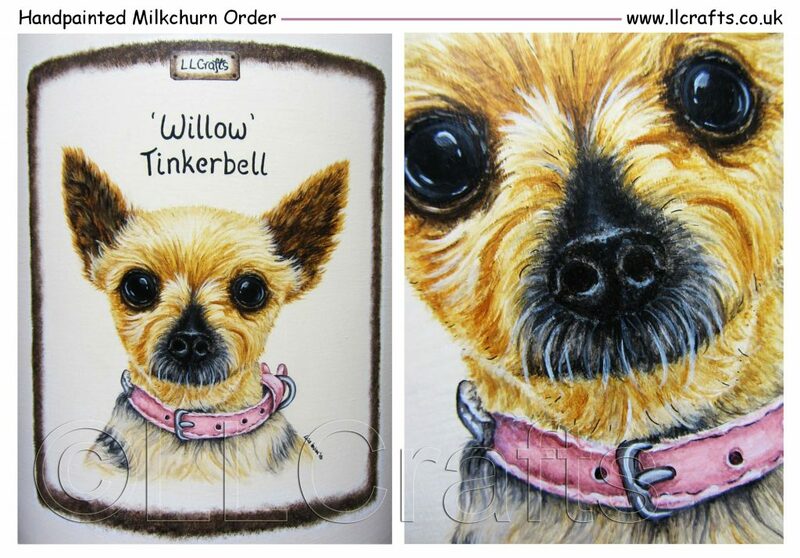 The very cute wee ‘Willow Tinkerbell’ Handpainted Milkchurn. 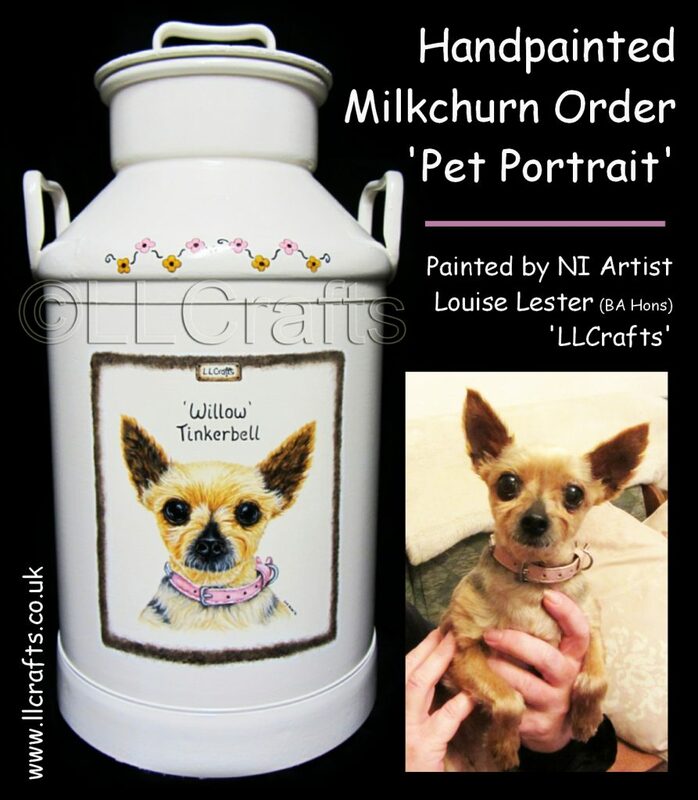 Lovely wee pet portrait …… so cute! Painted from a photograph of dog. 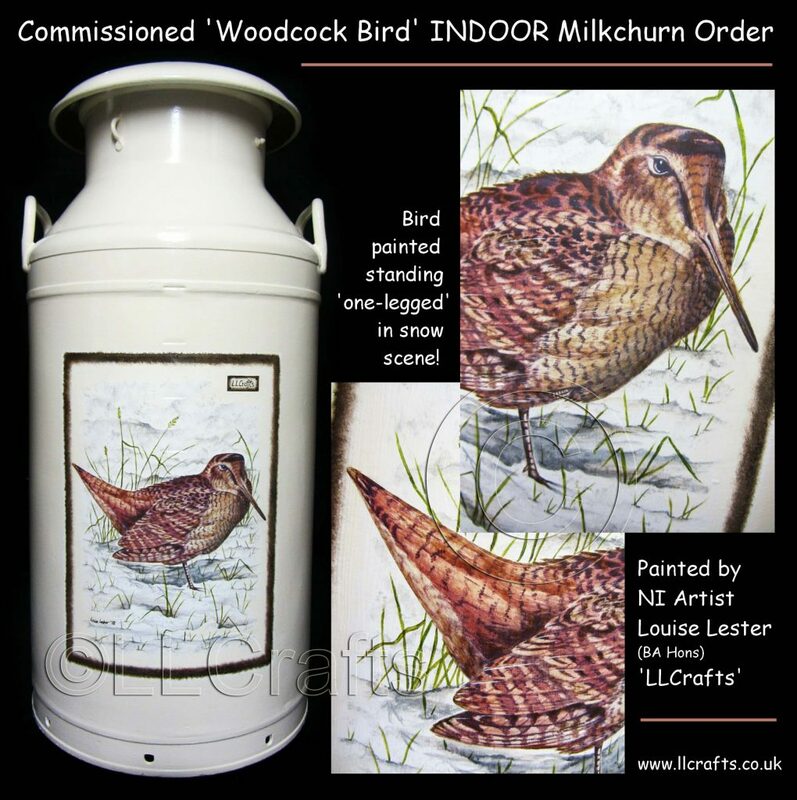 This customer’s INDOOR personal milkchurn order requested to have a ‘Woodcock Bird’ on their churn ……. my first ever ‘Woodcock Bird’ painting! Love the way the bird likes to stand ‘one-legged’ …… quirky. The churn is now in its new home in Ballymoney, Co.Antrim, Northern Ireland ……….. Happy Days!!! It was handpainted directly from the customer’s photograph. 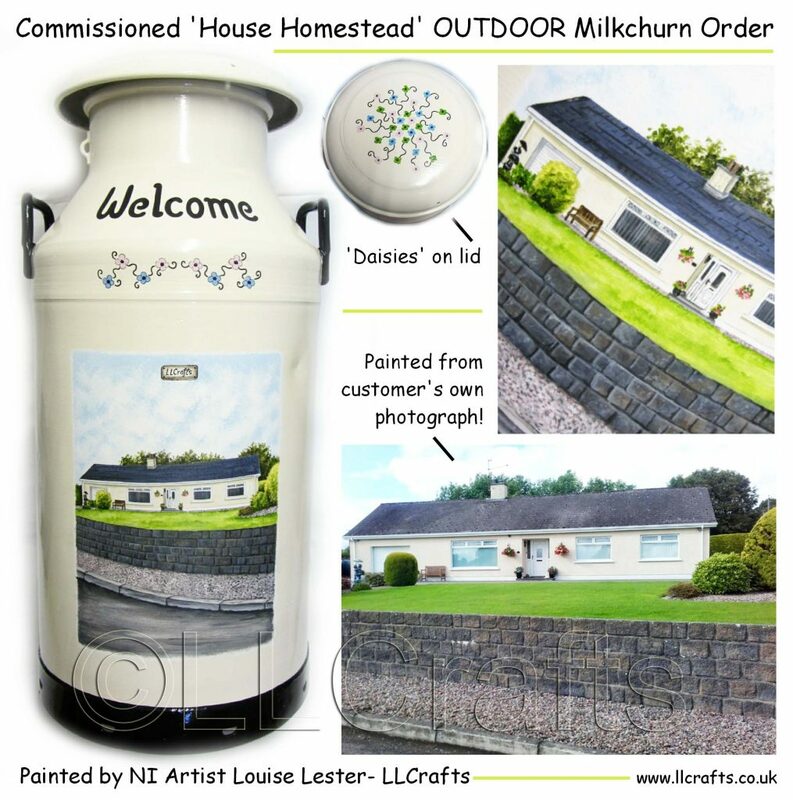 Loved completing this order, a matching ‘Commissioned Milkchurns Order’, which are now in their new home all the way down in Lurgan, Co.Armagh, Northern Ireland. A very personal order, as sitting on the tractor was the customer’s father and his loyal dog and the old homestead, with the beautiful old vintage petrol pump outside! It’s lovely being able to recreate old memories for my customers …… love it! This photo shows two separate customer’s churns ….. one is for INTERIOR use and the other for EXTERIOR! 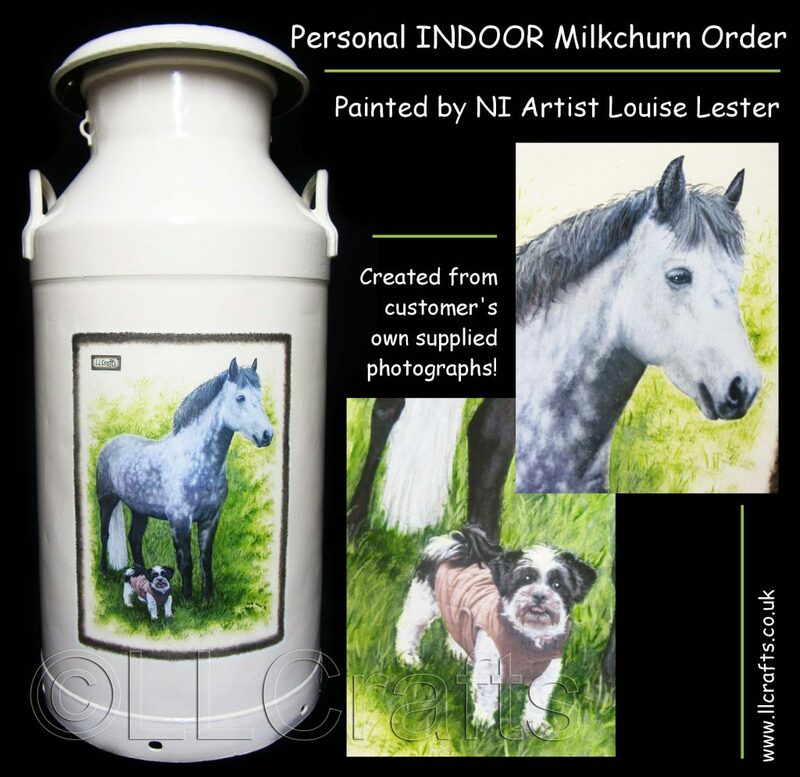 The INDOOR / INTERIOR milkchurn orders are less money than the OUTDOOR / EXTERIOR churns …… as they don’t quite need the same finishing coats for outdoors, but the quality is just as good! So its always nice to be able to offer choice!